Summer Sale Highlights and a little giveaway! Well folks, Christmas in July is over. Today, the Steam Summer Sale concluded, meaning that our purses are safe until coming winter and that we now have the time to play the games we grabbed during Flash Sales and other time-limited offers. Of course, being ahead of the curve as I am, I’ve already played a few of my catches, and I want to use this post to talk about the three best games I got during the Sale, while also giving you the chance of winning one of two copies of Awesomenauts! Sleeping Dogs: the only reason I didn’t get this game back when it was released was because it looked like nothing more than GTA in Hong Kong. Imagine my surprise when it turned out to be…GTA in Hong Kong. Nevertheless, Sleeping Dogs is a fun free-roaming action title, trying to offer a wide array of activities to the player. Sadly, many of these activities feel somewhat half-baked, and the story of the main plot is nothing to write home about. Still, for the six bucks it has cost me, I’ve been having some fun punching Triad members in the face and participating in street races. Castle Crashers: talking about being late to the party. How old is this game again? Well, old enough to be having loyal followers praising this hack ‘n slay sidescroller. After getting this one for somewhat less than three bucks and playing it co-op with Trivial Punk, Pixel Bubble and CheeeseToastie, I’ve been convinced that Castle Crashers is one of the greatest things that wicked place called Newgrounds has ever brought forth. Get your crash one with this one if you can! The Incredible Adventures of Van Helsing: this purchase took me entirely by surprise. After a friend convinced me that it was worth the fee of admission (about ten bucks), I sighed and purchased the game. To me, it looked like a cheap Diablo rip-off, covered with some steampunk aesthetics and East European landscapes. Boy, did I get schooled! Though the game doesn’t seem to have the replay value of other hack ‘n slay titles, the chemistry between Van Helsing and his ghastly companion Katarina is hilarious! Also, the places you visit and monsters you slay are well-designed, and some quirky twists to well-known mechanics make these adventures truly incredible. Four out of five dead werewolves for this one! So these are my three favorite purchases this past Summer Sale, but now I wanna hear about yours! I wanna hear your best Steam Sale Story! It doesn’t have to be about the past Summer Sale, but can also be about any other time Valve tempted you and your purse. Which purchase surprised you entirely? When should you have not spend your money? 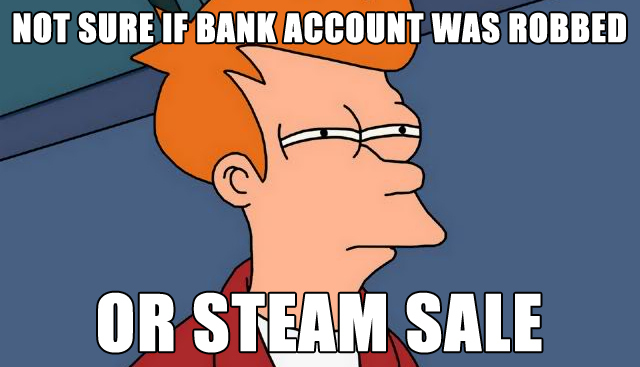 Do the Steam sales remind you of something personal? Share your story in the comments, and you might win one of two copies of Awesomenauts, ready to be unlocked on Steam! The contest will be running until Thursday, 25 July 2013 22:00 GMT+1. ← Fixing Elves, Part 2 – Rebel yell!